This is an exciting time for all of us and we’re so pleased to have you here today for a preview of what our guests will enjoy beginning on January 16—our opening day. It’s amazing we broke ground on this project in December 2016, just over a year ago. We are opening as planned. the Pokagon Band of Potawatomi Indians’ Four Winds Casinos® hosted a Media Tour this morning at its newest property—Four Winds South Bend®. Regional media were invited to a sneak peek inside the nearly complete 175,000-square-foot facility. The casino opens to the public at 4 p.m. on January 16. Located at 3000 Prairie Avenue in South Bend, the casino’s tour included stops at many of the facility’s key locations: The Grand Rotunda, the gaming floor, its restaurants—The Buffet, Kankakee Grille®, Copper Rock Steakhouse® and Timbers®—its three bars and White Birch Market coffee shop, as well as the Player’s Lounge and Outfitters retail store. Four Winds Casino South Bend will have 1,800 games, including progressive machines linked to a 16-state Native American progressive gaming network. The entertainment complex will employ approximately 1,200 people. South Bend’s Copper Rock Steakhouse is a premier dining, white-tablecloth steakhouse featuring prime USDA dry-aged steaks and over 450 wines. Kankakee Grille, Four Winds’ newest restaurant concept, offers casual fine dining in a warm and welcoming atmosphere. Its menu ranges from hot-stone tableside dishes to rustic shared plates. The Buffet at Four Winds South Bend features cuisine from around the world, fresh seafood and delicious desserts. Guests at Timbers Fast Food & Deli® can choose from an array of menu items including flatbread pizza, deluxe burgers, jumbo hotdogs, fries, hand tossed salads, and oven-baked deli sandwiches all in a casual atmosphere. Four Winds South Bend will open to the public at 4 p.m. on Tuesday, January 16. The Pokagon Band of Potawatomi Indians’ sovereignty was reaffirmed under legislation signed into law by President Clinton in September of 1994. The Pokagon Band is dedicated to providing community development initiatives such as housing, education, family services, medical care and cultural preservation for its approximately 5,000 citizens. The Pokagon Band’s ten-county service area includes four counties in Southwestern Michigan and six in Northern Indiana. Its main administrative offices are located in Dowagiac, Mich., with a satellite office in South Bend, Ind. In 2007, it opened Four Winds Casino Resort in New Buffalo, Mich., followed by Four Winds Hartford in 2011 and Four Winds Dowagiac in 2013. Four Winds South Bend will open January 16, 2018 at 4pm Eastern. It owns and operates a variety of businesses via Mno-Bmadsen, the tribe’s non-gaming investment enterprise. More information is available at http://www.pokagonband-nsn.gov, http://www.fourwindscasino.com and http://www.mno-bmadsen.com. Four Winds New Buffalo, located at 11111 Wilson Road in New Buffalo, Mich., Four Winds Hartford, located at 68600 Red Arrow Highway in Hartford, Mich., Four Winds Dowagiac, located at 58700 M-51 South in Dowagiac, Mich., and Four Winds South Bend, located at 3000 Prairie Road in South Bend, Ind., are owned by the Pokagon Band of Potawatomi Indians. Four Winds New Buffalo offers 130,000 square feet of gaming with more than 2,600 slot machines, 50 table games, five restaurants, entertainment event center, retail venues, a pool, and a 415-room hotel, making it the premier gaming resort in the Midwest. Four Winds Hartford features more than 550 slot machines, nine table games, a 74-seat restaurant, and a 15-seat bar. 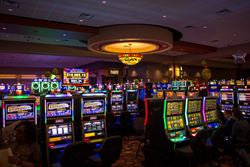 Four Winds Dowagiac features 400 slot machines, seven table games and one restaurant. Four Winds South Bend will have 55,000 square feet of gaming space, 1,800 games, four restaurants, three bars, a players lounge, a coffee shop, and a retail outlet. Please play responsibly. You must be 21 years of age to gamble. For more information on Four Winds Casinos, please call 1-(866)-4WINDS1 (866-494-6371) or visit http://www.fourwindscasino.com. Additionally, be sure to like Four Winds Casinos on Facebook at http://www.facebook.com/fourwindscasino and follow on Twitter at http://www.Twitter.com/fourwindscasino.